After two hours of hushed, busy scribbling and playing, we broke for a short discussion on how things had been going. 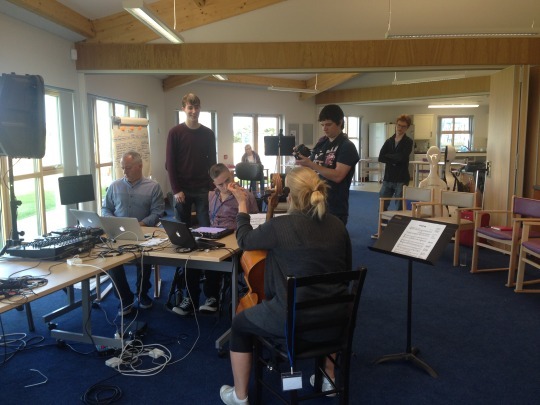 As the project evaluator, I was particularly interested in finding out about the experience from the composers’ points of view, as I had already had a chance to speak to some of the musicians. 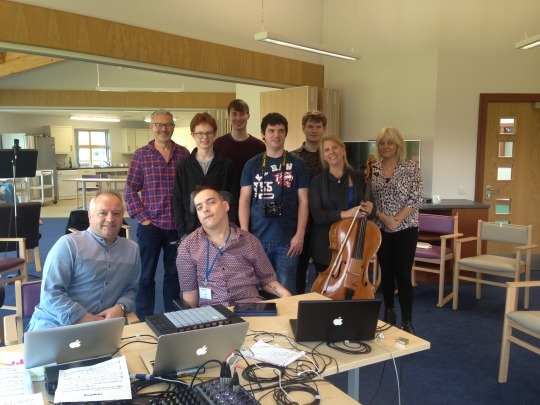 In the midst of a classical training at the Royal Conservatoire of Scotland, the composers were the people with the least experience of this kind of workshop – unlike Jay, who has worked with new technologies and instruments for some years, for example, and unlike Clea, who divides her time between working as a professional cellist and as a community musician. Nevertheless, the composers took to the structure of the workshops with ease. They all enjoyed working with new instruments, and as, Aidan said, had come “with an open mind.”Aran said it was rewarding to be able to compose a piece, see it performed, and continue to let the work grow with this real time feedback loop. It is in stark contrast, he said, to how it feels to compose a piece of music that only gets played months down the line. Alasdair Nicholson, from St Magnus International Festival, was pleased that the weekend echoed the positive ethos and drive of the St. Magnus’ longer Summer Schools. Every year, St Magnus Composer’s Course brings together composers for an intense, ten-day course in a range of working methodologies, leading to a public performance. The idea, he said, is for the schedule to be “almost overwhelming” in order to push musicians to be their best. This weekend, for Inclusive Creativity, the team had much less time to work together, but the same productive, supportive and creative atmosphere had emerged. In part, this was down to the personalities and bonding of the group. It may also have had something to do with the long, boozy dinners we shared at Lucano’s – Kirkwall’s best (and only) Italian restaurant. Nevertheless, the shorter time frame gave everyone a focus, and it could provide a model for future short courses at St Magnus –a happy but unexpected outcome of this R&D. I asked the group how they felt the project could develop in the future. Firstly, came the unanimous response, it should carry on – we should build on what we have done so far, working up the pieces devised by Aran, Aidan and Nick until they are ready to be performed by an inclusive ensemble. When it comes to the timing of a performance, however, the group was split. Some people felt it would be a good idea to include a public performance as part of any future course (this is what happens with the St Magnus Summer School). Others thought that a public showing could be a distraction. “It’s not the focus,” said Clea. We had a discussion about whether or not a public performance of work created in this way would need some kind of introduction, so that audiences could understand how the process effects the product. “Absolutely not,” said Alasdair, who regularly programmes diverse and inclusive work alongside ‘conventional’ or ‘mainstream’ performances. James suggested a model that he used as Artistic Director of Stravaganza, an inclusive performance company: to hold a public performance with no special introduction, followed by a technology day, in which audiences are invited to find out more about the instruments and technologies played the night before. This provides context without suggesting that the music needs to be explained in order to be appreciated. It also shifts the focus from ‘inclusion’ to ‘innovation’ as the guiding principle of the work – or demonstrates, at least, how two ideas are linked and reciprocal. In the end, all three composers used a mixture of the second two methods – the hardest methods of all, as they required an understanding of how the instruments worked, familiarity with the music from both Clea and Jay, and good communication between everyone to get to that stage. For his slow, atmospheric piece, Aidan even took up the Push – a brightly coloured board of lights that he had never played before this weekend.